Offering a seamless travel experience for the 44.3 million annual passengers of Orlando International Airport, the new Intermodal Terminal Facility (ITF) opened to Thanksgiving travelers in 2017. This completed the first phase of the South Airport Complex's construction plan, which will continue through 2020. The ITF also is expected to be the first building on the Orlando International Airport campus to meet the U.S. Green Building Council's LEED® v4 certification standards. Featuring an 8,000-square-foot, heavy-duty commercial skylight, the ITF's daylighting system helps connect those arriving and working within the space to the welcoming surroundings and Florida sunshine outside. Acurlite Structural Skylights, Inc. manufactured and installed the low-rise, segmented barrel vault skylight. Linetec provided stretch forming, thermally improvement and finishing of the skylight to meet the airport's aesthetic, sustainability and high-performance requirements. "Although the aesthetics are certainly important, the skylight specifications are more performance-driven than aesthetic," acknowledges HKS, Inc.'s associate principal, project manager, David Thomas, AIA. "Firstly, we didn't want it to leak and the skylight system needed to meet Florida product approval. The finish also needed to be able to withstand the harsh Florida climate and local airport conditions." The ITF's skylight system exceeds industry standards for air, water and structural stability. Acurlite tested and fabricated the system with a 30-year life cycle theory for longevity of product and overall system performance. Spanning 40.5 feet wide by 197.5 feet long, Acurlite's skylight was fully shop-fabricated and shop-assembled for on-site unitization and installation on the ITF. Hundreds of aluminum-framed segments compose the total skylight system. Linetec finished each aluminum framing member in a Bright Silver color using Valspar Fluropon Classic® II 70% PVDF Architectural Extrusion Coating Systems. Valspar's two-coat, 70 percent PVDF resin-based finishes applied by Linetec meet or exceed the American Architectural Manufacturers Association's high-performance exterior specification, AAMA 2605. Among the most weather-resistant of all finishes, paint coatings that meet AAMA 2605's exterior, architectural specification comply with rigorous testing that involves withstanding more than 4,000 hours of salt spray and humidity. These coatings also must maintain film integrity, color retention, chalk resistance, gloss retention and erosion resistance properties for a minimum of 10 years on the South Florida testing site. "The superior finish from Linetec allows Acurlite to provide an enhanced product to our customer that is aesthetically pleasing, but also can stand up to the harsh exterior environment, while providing a great warranty to the owner," says, Matt Snyder, sales and operations manger at Acurlite. As an environmentally responsible finisher, Linetec safely captures and destroys the liquid paints' volatile organic compounds (VOC) content before the finished material arrives at the job site. For the Orlando International Airport's ITF and other projects seeking LEED certification, choosing durable products with no-VOC finishes can be an important part of the selection and specification process. Painted aluminum extrusions also can be stripped, and re-used or recycled. For the ITF project, Keymark Corporation supplied Acurlite with recycled aluminum extrusions. Prior to finishing, Linetec stretch-formed the extrusions to the barrel vault skylight's required radius. Maintaining close and consistent tolerances, the stretch forming process yields a smooth and even curved surface. "Linetec has been a great system partner to Acurlite and is our finisher of choice," adds Snyder. "Between enhanced lead-times and customer service, Linetec has been a great supporter of Acurlite and our customers." Keeping travelers comfortable beneath the skylight and the outside Orlando sun, the skylight's thermally improved aluminum framing complements the high-performance insulated glass unit (IGU). The IGU incorporates solar-control, low-e, laminated glazing, plus Viracon's Viraspan™ Design silk screening, to achieve a solar heat gain coefficient of 0.24 and a U-factor of 0.45. 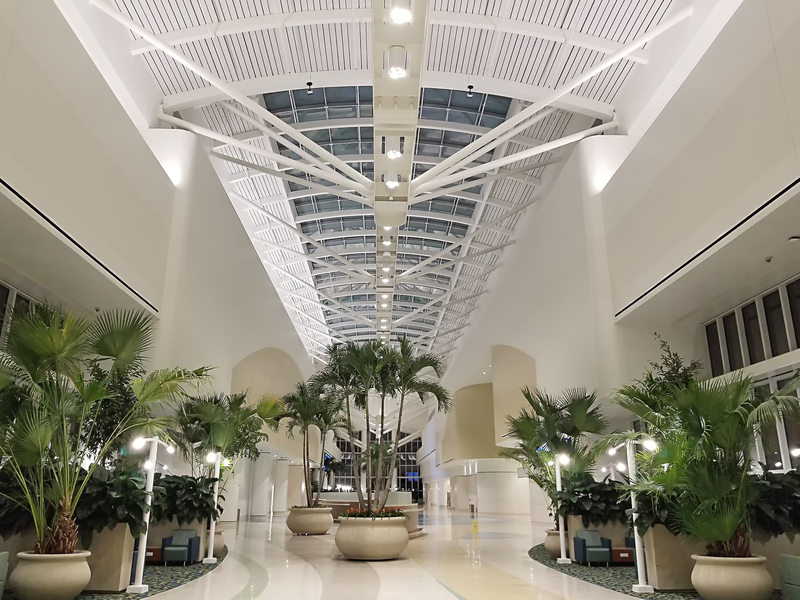 The skylight's thermal performance, recycled aluminum and durable finishes also support the Orlando International Airport's Sustainability Management Plan, its LEED target and its goal to reduce energy use by 10 percent by 2018. Along with the finished skylight meeting the airport's sustainability goals and performance specifications, Thomas notes that it appeared to be a "quick and easy installation." Acurlite installed the ITF's skylight as scheduled by October 2017. The overall, multi-phased timeline for the South Airport Complex began in early 2017 and is managed by Turner-Kiewit Joint Venture. Part of Greater Orlando Aviation Authority's $3.1 billion Capital Improvement Program, the South Airport Complex ITF consists of approximately 2.7 million square feet of space accommodating four types of rail systems, an attached parking garage and an Automated People Mover system that links with the existing North Terminal Complex. "Today's travelers to Central Florida demand a higher level of service and efficient connections to other modes of transportation, so it is essential that we strive to stay at the forefront of innovation, customer care and improved connectivity," says Greater Orlando Aviation Authority Executive Director Phil Brown.